Works are selling at Art Basel Miami Beach but the buzz of years past has dissipated, leading to a less crowded fair where galleries can do business and collectors can peruse with slightly less fanfare. According to The New York Times, the blue-chip galleries Gagosian, David Zwirner, Pace and Andrea Rosen are all making sales and the slower pace of the fair has had the positive effect of increasing museum acquisitions because there is less competition for availability. The Wall Street Journal reported that major collector Steven A. Cohen bought a work by Tim Hawkinson for $180,000 from the gallery Blum & Poe and Adel Abdessemad’s “Mappemonde” for approximately $300,000 at Zwirner. 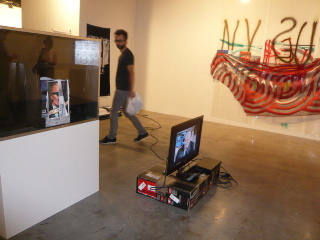 Here is a slideshow of the scene at Art Basel Miami courtesy of WLM Advisors. I intended to crteae you that little note to be able to thank you over again for your striking suggestions you have featured on this page. It was so surprisingly open-handed of people like you to supply without restraint what most people could have offered for sale as an e book to generate some dough on their own, chiefly since you might well have done it in case you considered necessary. The solutions also worked as a easy way to fully grasp other people online have a similar desire really like my own to find out more and more with reference to this problem. I’m sure there are lots of more pleasurable opportunities in the future for individuals who looked over your site. I’ve read this publish and if I may I wish to recommend you some attention-grabbing things or suggestions.